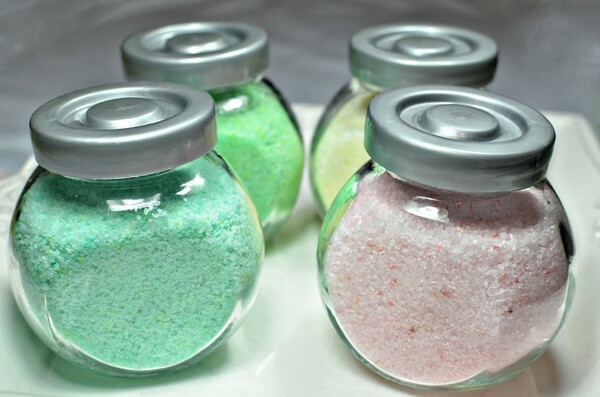 These easy bath salts are sure to please any reciepient. If giving as gifts make sure you label and give directions. A wonderful basket basket idea is to make a few and put in pint jars as a gift basket with a luffa or back scrubber. Combine in a zip-lock plastic bag. Make sure there aren't any clumps. To use: add 1/3 to 1/2 c. of the above mixture to your bath water. Makes 4-6 baths. Will fill a 1/2 qt canning jar. For extra potency, add 20 drops peppermint E.O. Combine and store in a plastic zip-lock bag. For use, add 1/3 c. to bath water. If you want it stronger, add more. Makes 1 qt canning jar full. Makes 12 baths. Cna be divided into two pint Jars as gifts each making 6 baths. Great for poison ivy bath soak or anytime! lavender. Blend until all ingredients are a powdery consistancy. Use 1/3 cup for each bath. Makes 1 qt, 12 baths. Can be halfed and put into two pint jars. The easy-to-find ingredients for this wonderful bathing mixture help to relieve soreness and aching joints and muscles. Soothing and relaxing, Healing Salt Crystals draw out impurities from your body and deoderizes, too! With many of the healing properties of a seaside spa, this formula is perfect for the day after a strenuous workout, or for any time you need a little healing time-out. If you can't get away to the beach, you can at least relax in a tub with these lovely crystals. clay, then mix in the dried lavender, stirring with a wire whisk. the bowl with a towel and leave overnight to fix the scent. seal or muslin bags, or envelopes. Add ¼ to ½ cup healing salt crystals to a tubful of warm water. 16 drops of Ylang-Ylang and Chamomile essential oils mixed together. Place the herbs and the Epsom Salts together in a bowl, add the oil to this mix and mix breaking up clumps, place towel over it over night and package after mixing again in the morning. Makes 3 bath bundles. Place 1/3 of mix in each of three muslin 6 inch squares of fabric and tie shut with a pretty ribbon. To use Place the tied bag under the running water in the tub. Allow the salts to dissolve and then the bag may float in the tub with you. This mix will relax sore muscles, lower high blood pressure, calm and quiet frayed nerves. Make your own bath salts. Give as gifts. Jasmine has been used for healing the female reproductive system. In Ayurvedic medicine jasmine is used to calm the nerves, sooth emotional problems, help with PMS and tension headaches. Because Jasmine has antispasmodic properties it can help relax the uterine cramps and pain during childbirth. Jasmine has astringent properties which aids in treating inflamed skin. Jasmine is used in aromatherapy to calm the emotions, and as an aphrodisiac. It is a valuable remedy in cases of depression because is produces a feeling of confidence , optimism and euphoria. It revitalizes and restores the balance of energy. These lusciously scented "kisses" are a bath time luxury. It is stimulant, but seldom used now internally, though formerly was in great repute . Pliny mentions it as an antidote to hemlock. Avicenna (tenth century) recommends it for tumours, ulcers, vomiting, dysentery and fevers. In China it is used for leprosy. Plus it is very moisturizing. Pour into small candy molds and place in the freezer for 20 minutes. Remove from molds. Place one or two 'kisses' into hot bath water. Store the rest in a Ziploc bag in the freezer. To give as gifts individually wrap with plastic wrap and label. then the can be put in a jar to give as gifts, remember to tell them to keep in freezer. Lavender - Lavender can be used medicinally as an effective remedy to combat the following conditions: Restlessness, insomnia, abdominal complaints, rheumatism, and loss of appetite. Lavender oil topically applied on the temples helps cure headaches, migraine etc, as the oil is absorbed by the skin and the constituents of the oil calm the nerves, relieving pain and excitability. cramp bark is used for circulation and cramping. Use 1 per bath of hot running water. A great idea for any one who works hard or has sore muscles. Also makes a great gift in a pretty glass jar. Place 1 1/3 cup of Epsom and 1/2 cup sea salt in a bowl or resealable plastic bag. Add 3-4 drops peppermint oil. Place the remaining ingredients in a second bowl. Mix all ingredients well. Layer the red and white salts in a clear bottle or jar. Tie with a ribbon and some small candy canes. This makes a great holiday gift for friends. Makes 2 pints or 4 half pints.